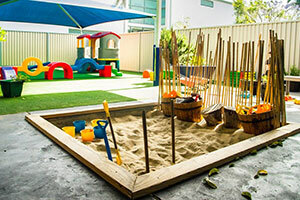 Each day the children are provided with opportunities to explore a range of experiences within key learning areas in both the indoor and outdoor learning space. Including but not exclusive to, building with blocks, construction, manipulative equipment, engaging with a range of literacy and numeracy experiences, exploring and creating pieces using creative art mediums, sensory exploration, role play, exploring the natural and man- made world around them through a range of resources and interests. We celebrate, respect and share children’s involvement in learning through a range of pedagogical documentation. Children’s learning is displayed in our daily diary, favorite thing web, our Talking/thinking project book, the Children’s portfolios and wall displays. All of this documentation is made available to parents in order to ensure open communication. This ensures families are aware of the children’s interests and their learning. Our program and curriculum is child centered, with the overall objective being to develop the children’s intrinsic interest in learning and discovery. Specific experiences are planned for focus children or small groups based on their interests. The intention of all interactions is to facilitate and scaffold children’s learning and develop dispositions necessary for the children to become life-long learners. Our curriculum is influenced by many Educational theories, some of these include; The Emergent approach, The Project approach and the Social- cultural approach, the Montessori approach and Howard Gardeners Theories of Multiple Intelligences. "Play is the highest expression of human development in childhood for it alone is the free expression of what is in a child's soul."